1. The degree of clinicopathological correlation between the pre-appendicectomy CT report and the post-appendicectomy histopathology reports should be sufficient. 2. The number of removed appendices that are histologically normal should be acceptably low. A search was performed for the last 100 cases for the keyword appendicitis. The reports which had a diagnosis of acute appendicitis were used. They were split into two groups i.e. in-house reports or Medica. The histology reports were reviewed retrospectively and compared to their CT. 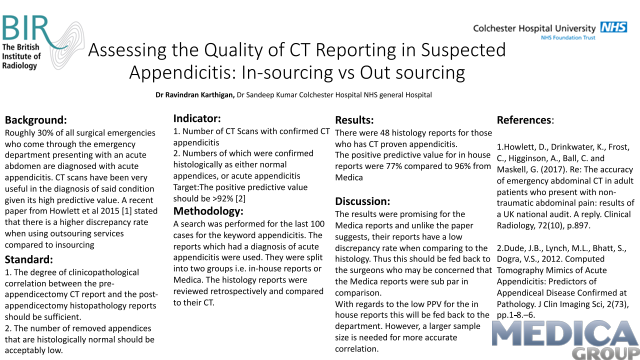 There were 48 histology reports for those who has CT proven appendicitis. The results were promising for the Medica reports and unlike the paper suggests, their reports have a low discrepancy rate when comparing to the histology. Thus this should be fed back to the surgeons who may be concerned that the Medica reports were sub par in comparison. 1.Howlett, D., Drinkwater, K., Frost, C., Higginson, A., Ball, C. and Maskell, G. (2017). Re: The accuracy of emergency abdominal CT in adult patients who present with non-traumatic abdominal pain: results of a UK national audit. A reply. Clinical Radiology, 72(10), p.897.